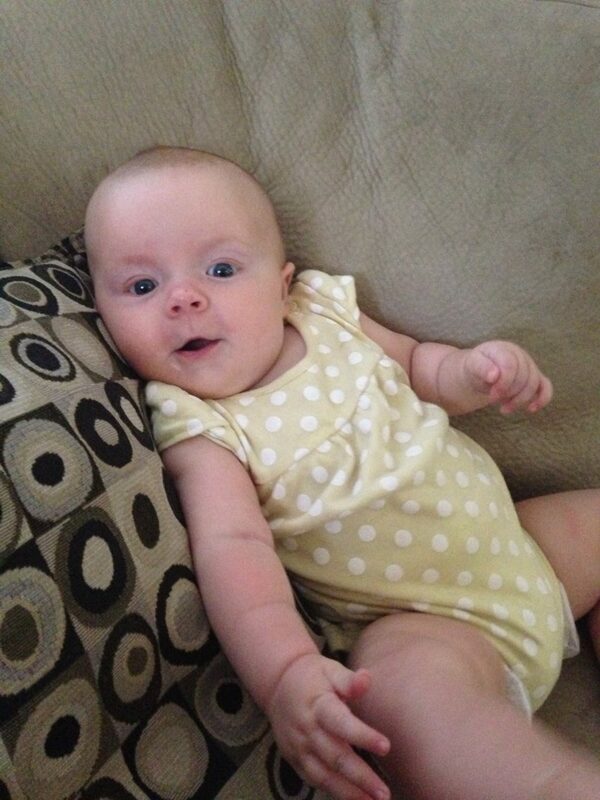 Seems like it was only yesterday that I couldn’t see my own feet, yet Bridget is already six months old. She is growing like a weed. John and I were both only children, so this whole sibling thing is a novel experience for us. One thing we are discovering is how different every child is. There are so many theories about how environment affects child development that it’s easy to believe that parenting choices have consistent results. You can easily fall into the trap of believing there is one “right” way to discipline, or to reassure your child, for example, because you had positive results when you tried it. Yet Bridget has a distinct personality, already different from that of her big sister Brontë.So far, Bridget is much calmer, much less temperamental than her big sister in every way except one… she flies into a biting, scratching, screaming jackal-baby whenever she is hungry, and Bridget is much hungrier than you would ever think possible for someone who probably has a stomach the size of a crabapple. Though I am still breastfeeding her as much as possible, her demands have far outstripped my supply at this point and I have the angry-baby welts, scratches, and bite marks from chin to bellybutton to prove it. It feels like I’m nursing a jackal. I’m pumping every chance I get in a mad attempt to increase said supply, and most of my free time is literally being eaten up by a frantic dash to get more food into my crazed infant. Our Vitamix is well used, these days, as every spare fruit and vegetable, grain and nut butter is blended into supplemental food smoothies we try to stuff down her gullet before she takes a match and burns the house down to the ground. She will easily knock back ten ounces of milk in a sitting, then scream for more. I have made her drinks involving, say, a couple bananas, a few tablespoons of almond butter, some ground oatmeal, a couple cups of coconut water. I’ll think… This will definitely do the trick. She’s going to be absolutely stuffed… then watch the concoction disappear in under five minutes before she breaks into shrieking fits while clawing at my face. It’s not only exhausting, but baffling… WHERE IS SHE PUTTING IT? THE FOOD IS BIGGER THAN HER BODY! I swear this kid is going to eat us out of house and home.